Chess Tiger is one of the strongest chess programs in the world. It has been rated as the world's strongest chess program TWICE. Now it is available for all the Palm handhelds and all compatible computers, phones and PDAs, including the Palm Centro line, the Palm Treo line, the Palm Tungsten line and all the handheld computers made by Sony (click here for a list of compatible devices). With Chess Tiger you get an opponent able to adapt to your strength and help you to improve your chess... Everywhere! People have voted and have elected Chess Tiger as the best game at Handango! Not just the best chess game, but the best of all games available at Handango! Tucows has awarded Chess Tiger the maximum possible score: 5 stars... well cows. Tucows has very high standards of judging software, so getting 5 cows is a real achievement. Chess Tiger has received the PalmTop Pro Award in recognition of exemplary software development. PalmTop pro is a magazine specialized in PalmOS software. 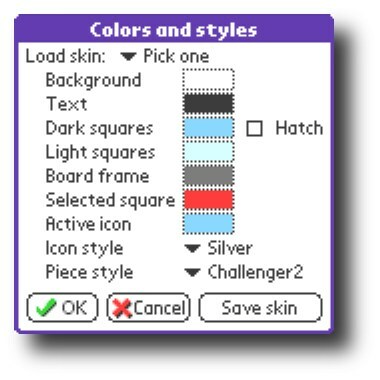 Support for high resolution graphics with high resolution piece sets. 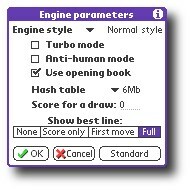 Improved chess engine: the new chess engine retains all the strengths of the classical Tiger engine but is now 60 elo points stronger. Most problems will be solved twice as fast in average, and the engine will now play moves it would have been unable to find in previous versions. For example, Chess Tiger on a Palm T|X is now approximately 2315 FIDE Elo (european scale) or 2515 USCF Elo (american scale). Display of the computer's estimated Elo strength in the "Speed index" dialog. Just tap on a piece and the program shows you all the legal moves for this piece (this works even in the unregistered mode)! Naturally this "teacher mode" can be disabled as soon as you become an experienced player. 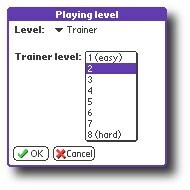 8 trainer levels of increasing difficulty designed to improve your chess skills. The engine knows and applies all the official rules of chess. The engine is of very high quality, the guarantee to learn from a good professor. Chess Tiger is able to adapt itself to your strength and will give you winning opportunities, so the game never bores you. Chess Tiger can give you a reasonably good advice when you do not know what to do. Hold the stylus on an icon for one full second to get help on its function. Shows the captured pieces: so you always know who has the material advantage. Chess Tiger is one of the strongest chess engine available in the world. 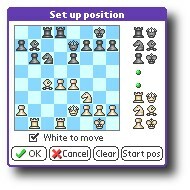 It has been rated as the world's strongest PC chess program TWICE by the SSDF (an independant organization which is regarded as the most reliable source in the field of computer chess). Chess Tiger for Palm has achieved a rating of 2101 SSDF elo, or 2101 FIDE elo (more than 2300 USCF elo). The SSDF list is the worldwide recognized and independent computer's rating list. The Chess Tiger engine on PC has recently been ranked #1 on the SSDF list. Chess Tiger 14.0 running on a PIII-866MHz PC has achieved for the first time in history a Grand Master Norm!!! It was in Argentina in July 2001 during an official tournament. Chess Tiger has beaten one International Master and four Grand Masters in a row, achieving the astounding performance of 2788 Elo!!! 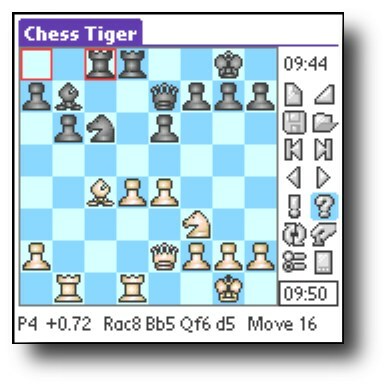 Chess Tiger for Palm includes all the chess knowledge of the PC version. It is actually the same engine, with the only difference that support for endgame databases has been removed and that a Palm is not as fast as a PC. 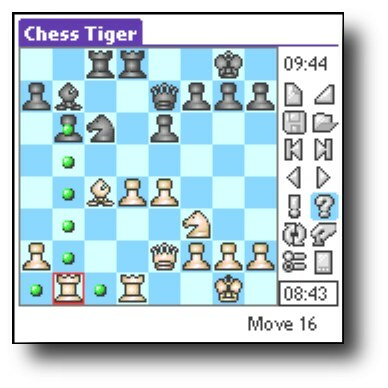 Chess Tiger for Palm is the strongest chess engine available for the Palm platform. 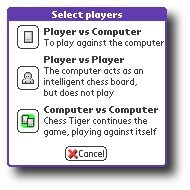 This has been demonstrated by playing matches against the other Palm chess programs. Chess Tiger has won all the matches. More information on our FAQ pages at www.chesstiger.com (click on the "FAQ" link located at the top of the page). You can save your games, and replay them later. 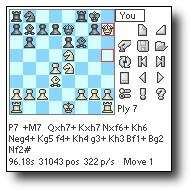 You can exchange games and positions with your favorite PC chess program with the built-in PGN and EPD support. You can set up any position. The engine displays its thinking, up to 20 plies ahead. The engine supports all kind of time controls, including blitz (any number of minutes) and multiple controls. You can play using up to 3 time controls, for example 40 moves in 2 hours followed by 40 moves in one hour followed by rest of the game in 30 minutes. All the time controls are fully customizable. 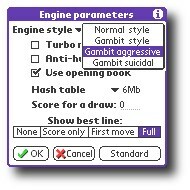 You can analyze games with the "analysis mode": just browse through a game and let Chess Tiger give its opinion about each move. You can detect blunders and missed opportunities. Use it to analyze your own games and improve your play! 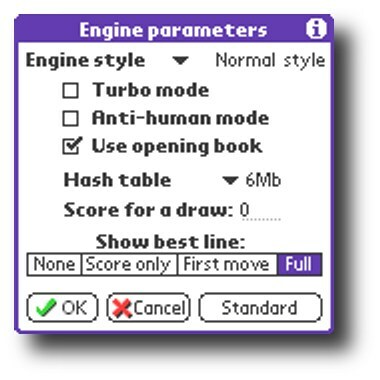 The engine is able to prepare its answer while its your turn to move with its "Turbo mode" feature (also called "Permanent Brain"). The amount of "hash tables" (a cache memory that helps the engine to be stronger) is configurable, from 12Kb to 12Mb. Icons allow you to access to the most frequently used functions in just one tap. 6 different "views" including full screen board or smaller board with loads of information around it (clocks, move list, thinking, icons...). 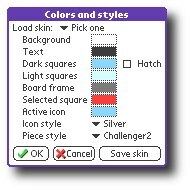 Color and gray scale support. 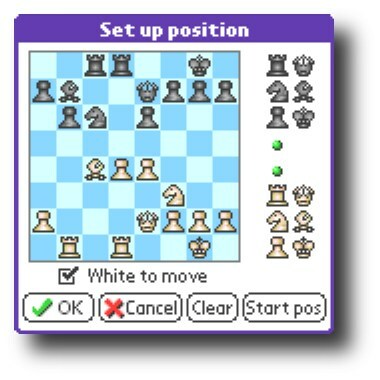 2 players mode: in this mode the program acts as an intelligent chessboard with clocks. Saves games into the standard MemoPad application. Your games are automatically transferred to your PC or Mac when you press the HotSync button. 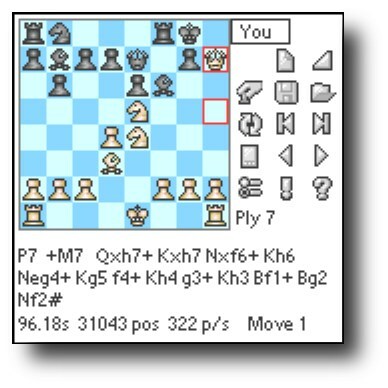 You can then transfer the games into your favorite PC/Mac chess program with cut and paste. You can beam games or positions to your friends. "Reopen last game" allows you to retrieve the most recent game, even if you have forgotten to save it! 4 different playing styles, ranging from the quiet "Normal" Chess Tiger style to the kamikaze "Gambit suicidal" mode. Can you stand the crazy attacking style of Gambit Tiger? Includes an opening book of 8000 chess positions. The opening book can be turned off. 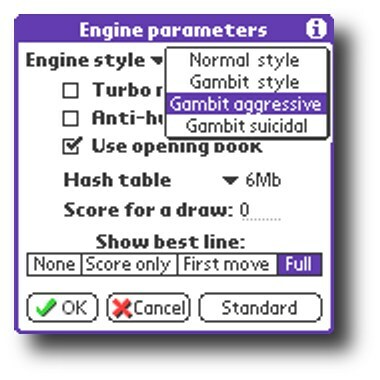 With the help of the "2 players mode", you can force the program to play any opening. Works on all PalmOS compatible models including the most recent ones: the ZIRE, the TUNGSTEN and the Sony NR70 and NX70. "It’s easily the best chess program on the Palm OS." 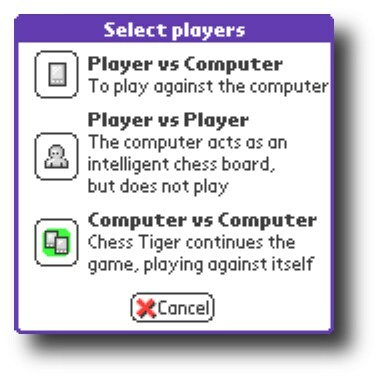 "By far and away the best chess program for Palm..."
for Palm PDAs is Chess Tiger for the Palm." "I have purchased and installed chess tiger on my Sony Clie UX-50. It is an awesome product." "Thanks very much. Chess Tiger is a great program :)"
"I purchased Chess Tiger and love it"
"Thanks for a great program, you've done a really good job. Thanks again and keep up with good work!" "I love your chess program!!" "Hi there, am really enjoying using Chess tiger"
"I recently purchased Chess Tiger for my palm tungsten E. Great program :)"
"I downloaded the new version 15.1 for my palm a few weeks ago (I'm a registered user). Congratulations - the new set of pieces is brilliant and I like the whole program a lot"
"About 9 months ago I changed jobs and lifestyle. I sold my Palm and all my Palm software with it, including my license to Chess Tiger. Much time passed, and after a while I realized that I missed having my little pocket chess program with me everywhere I go! So the other week I decided to buy another PDA. The sole reason for making the purchase was so that I could bring Chess Tiger with me everywhere I go! Now I am happy again, as I have a new Tungsten E with the latest version of Chess Tiger on it, and I can bring it with me wherever I go. I can get a quick game in at the coffee shop or on the road. Chess Tiger continues to be the best electronic game of chess out there. Keep up the good work!" "I have handed over my Palm/Chesstiger to my 10-year-old Thomas. He plays day-in-day-out!" "Anyway chesstiger is the best chess program I've seen and I'm glad I ran across it. It's much better than a physical electronic board." "I am a lover of chess and I like the ChessTiger very much"
"Have played Chess Tiger and love it"
"I've bought Chess Tiger and I'm really happy I did." "Your software is fantastic !" "I love the Chesstiger program for my handheld"
"Thank YOU! It works great... This is truly a great program!" "Your software is really great. I already had bought a chess game for my palm but yours is miles better." "Chess Tiger is really very good." "I just downloaded the trial version of chesstiger. I am impressed!" "I got chess tiger with my Palm Tungsten E, it is fantastic." "I am definitely VERY happy with Chess Tiger." "Awesome program. I just bought a Novag Star Sapphire handheld and it was HORRIBLE in the visibility, graphics and ease of use department. Had to return it right away. $230. Got a Palm Vx for free (someone was throwing it away) and put Chess Tiger on it. Palm + Chess Tiger is the ONLY way to go. Love it!!" "Hi ingenious people at Chess Tiger. What a great piece of software Chess Tiger is!" "Your chess engine for Palm Tungsten is great. I had it play chessmaster for fun and it won every time, it is clearly superior." "I have been using Chess Tiger on a Palm M130 for about a year now. I really like it a lot and usually find time while working (I'm a teacher) to get in a game or two. I play on it's trainer levels to give me a chance to beat it." "Hi... Just bought your ChessTiger program for my Palm Tungsten-T3. Excellent!" "Thanks for a great program!" "Just bought Chess Tiger and love it!" "Chess Tiger was the reason I chose to buy a Palm OS handheld." "Chess Tiger is exactly what I've been looking for. It is easily worth double what you're charging!" "Hi, thanks for the great chess software that has given me many great hours of playing, and has helped me slowly develop my chess game (I'm at trainer level 7 when playing white and 6 when playing black now)." "As a registered user, I love this app, and its wide range of compatibility with all Palms." 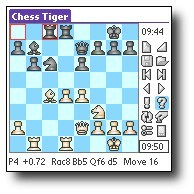 "I recently registered Chess Tiger 15.1 for the Palm OS. An I can tell you, I love it. it plays strong chess and I am thankful for the trainer levels." "I want to thank you for creating a very nice product." "Chesstiger is definitely the best chess programm available for PDAs." "I'm impressed with the product and your support." "I have bought ChessTiger for Palm and it's a wonderful program. Congratulations!" "Thanks! Your program is one of the best arguments for owning a Palm!" "On a side note, I've recently purchased a T2 (from my old M500) and the game is just so beautiful now. The developers did a great job making the most of the color." "I have bought Chess Tiger (through Handango) and I think it is a terrific software, even better than other softwares that I have tried on my desktop." "I want to thank you all, first for developing such a powerful engine, and nice interface; and second, for beign a truly serious enterprise, at first I wasn't sure you would help me out, but you did! And I'm very glad to be one of your proud customers, keep up the good work and thanx for making my night shifts less painful again!!!" "I think Chess Tiger is awesome! It's my favorite chess program and the first game I put on my new Zire 71."